Q. What is the number to focus upon? A. It is a ratio, commonly referred to as the Adult-to-Adult ratio. In a stable population, for every two adults spawning, two of the eggs must survive to spawn the next generation. A stable population has an Adult-to-Adult ratio of (2:2) or equivalently (6:6). A growing population has a better ratio. A declining population has a worse ratio. 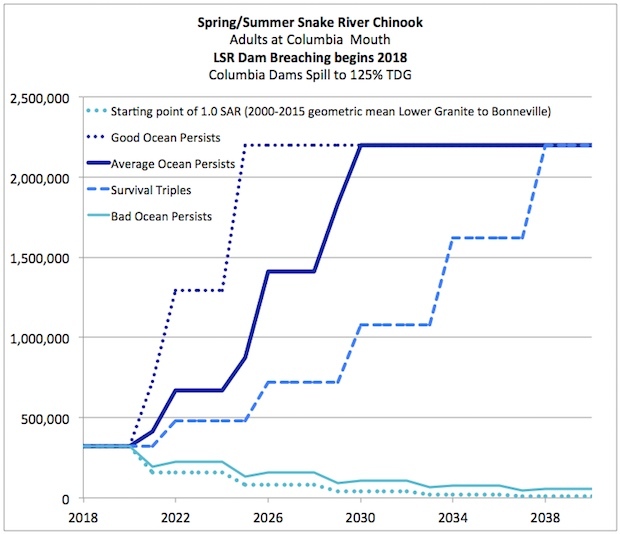 Snake River Spring/Summer Chinook Adult-to-Adult ratio is currently around (6:3), six adults return only three spawners. Fall Chinook are faring just a tad bit better with an Adult-to-Adult ratio of around (6:3.3). A. What is the baseline? A. Herein, the baseline will be the estimated adult count at the Columbia River mouth. Q. 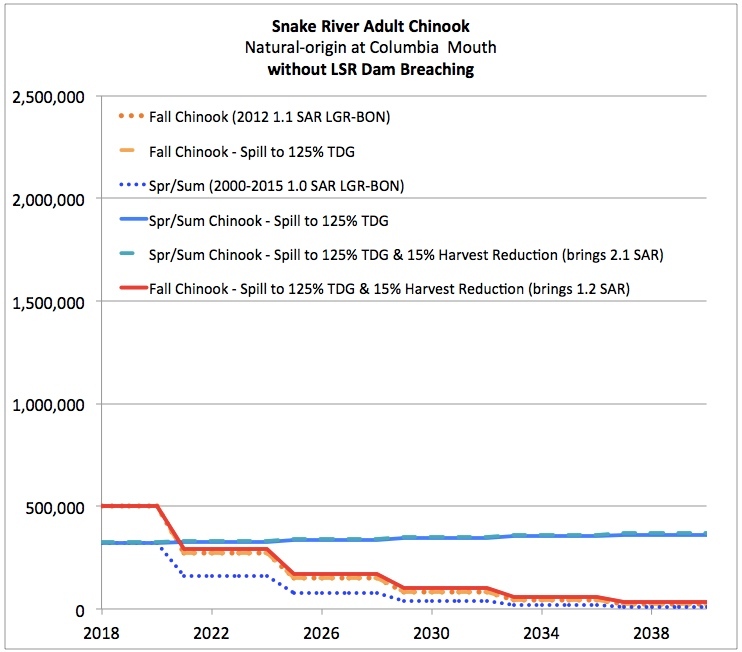 What are the benefits to Chinook abundance and how long will it take returns to benefit? Q. What is current recovery plan? Q. What are the impacts of hatchery closures that would follow LSR dam breaching? Q. Would there be a net loss of Chinook? Q. What is the source of the LSRCP funding? Q. What is the potential of losing funding of the LSRCP hatcheries? Q. There are costs, right? Compute the dollars per fish gained. What provides the biggest bang for the buck? Q. What is current mitigation plan? Q. What is the role of the Federal Caucus agencies? Q. What role can Washington Governor Jay Inslee have in this authority? Q. What role does Idaho, Oregon have in this? Q. How fast can things happen? Q. What will dam breaching cost? Q. What are the impacts to recreation on LSR reservoirs and at LSR dams? Q. What are the impacts to irrigation? Q. What are the impacts to transportation? Q. How much would loss of transportation cost? Q. What are the Greenhouse Gas impacts of losing barge transportation? Q. How long will it take to implement the mitigation efforts? Q. Will mitigations be in place before breaching? Q. What would it cost to replace the power production benefits? Q. What are the Greenhouse Gas impacts? Q. What are the Electric Power impacts? Q. What are the Voltage Regulation impacts? Q. What are the Grid Stability impacts? Q. Who would fund the removal of earthen embankments of the four LSR dams? Q. What is the Cost of breaching the four LSR dams and what is the funding source? Q. What are the implications of Court Rulings? Why have they not conclude in a definitive order to breach? Q. Why did the 2002 EIS not concluded in a definitive order to breach? Q. What are the implications of NEPA/CRSO? Q. What is the current NEPA process and timeline, and how does that change if Orca are included in that process? Q. If you're thinking about tearing down the dams tomorrow, what about the lawsuits and how long will that take? Q. What about the dams that have no fish passage? Why is the focus on the four LSR dams? Q. 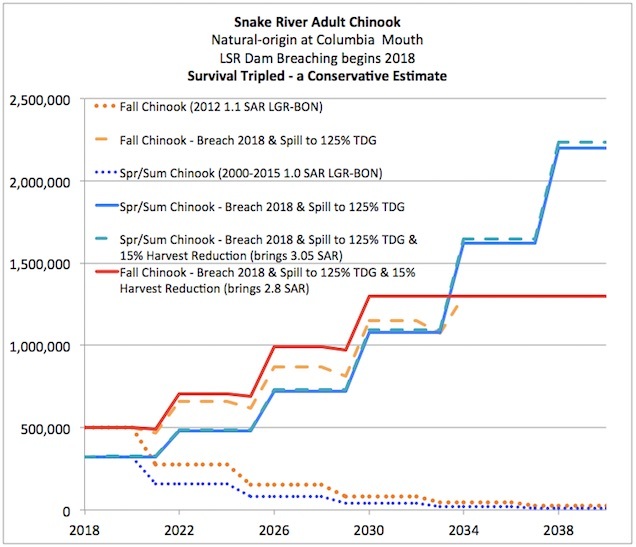 Are there dams above the LSR and how does that effect the recovery of Chinook? Q. Before the first LSR dam was built, salmon and steelhead numbered in the hundreds of thousands on the Snake River. Q. After the first LSR dam was in place, these numbers began to decline and continued to so as each subsequent dam was added. The concept of sustainability has been increasingly brought into focus as we have become convinced that all systems on earth are interrelated and that many of today's problems were the solutions of yesterday. Sustainability is, however, a very old concept. Most American Indian cultures understood the importance of sustainability and sustainable development, living in harmony with all things.